Hoverboards; Two-wheeled Scooters - Review of the most viral ride-on Gadget yet! Hoverboard, hoverboards & hoverboards everywhere! 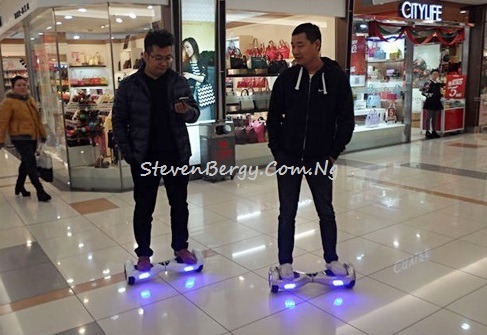 It seems like hoverboards are the latest celebrity ride-on gadgets in town. The hoverboard started making waves not quite long ago when the American rapper, Wiz Khalifa was arrested for riding one at the Airport. Even a Nigerian singer known as MayD was also arrested for using one in a shopping mall in Lagos, Nigeria. The managing director of the Dubai-based company in Nigeria (InnJoo);Robert Liang also entered the stage on his at their product launch recently. If you've seen the official video of Meek Mill ft Nicki Minaj ft Chris Brown - All eyes on you, you'll notice they also used it there. Apart from the cases referred to above, Chris Brown, Jamie Foxx, Mike Tyson, John Legend, Justin Bieber and so many other celebrities have been spotted riding on hoverboards. 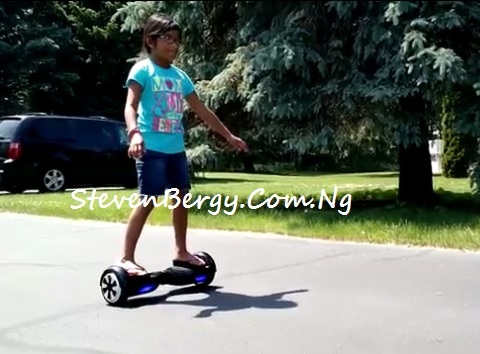 Check out some pictures of the ride-on gadget (hoverboard) below! But here is the important question I'll like to throw to you all - "Are these really hoverboards?". To answer this question correctly, the word "hoverboard" consists of two words which are "hover" and "board", we all know what a board is so let's visit a dictionary to get the real meaning of "hover." According to the free dictionary, hover means to remain floating, suspended or fluttering in the air. Now with the definition here, do you think those ones we've been seeing around (pictured above) are hoverboards ? No, they are not hoverboards since they don't hover, instead they are scooters - two-wheeled scooter to be precise. People just call them hoverboards (maybe because of the yawn we have for real hoverboards and because we are getting closer to having them) and it's really becoming so bad that even if you Google "hoverboard" right now, you'll only see a bunch of shopping links and images for two-wheeled scooters. 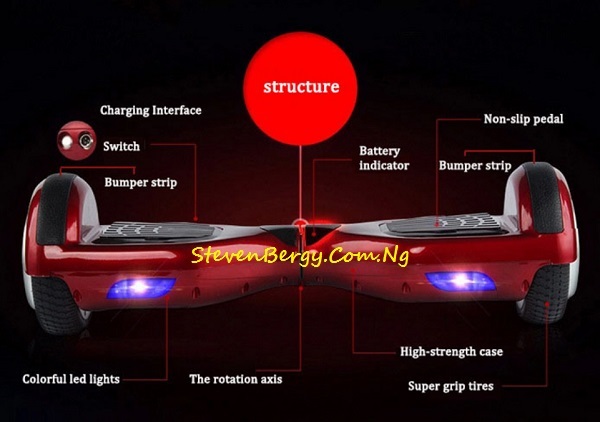 There is one thing you must put in mind to differentiate a hoverboard from other ride-on gadgets, that is "hoverboards hover, they don't have wheels" and "if it has wheels, it's not a hoverboard" so don't let anyone confuse you to believe that those scooters are hoverboards. In reality, there are no real hoverboards yet apart from the one shown in the animation below - Hendo Hover (unfortunately, it's still not commercially available yet though). Now that you know the real name of the thingy people are riding around, let's focus on the hoverboard itself for a while. You might be wondering - "where did the idea of hoverboards come from? ", "is it really possible to stay on a flat tech gadget that will float and move without using wheels?" and "How close are we to using real hoverboards?" You see from the above scene how sweet it is to ride on a hoverboard. Since then, every interested individuals, start-ups and companies have started trying to build the first real hoverboard and make it public. In theory, this is possible because according to Physics, two magnets with the same polarity repel each other so if one of the magnets can be placed on the floating board and the other one in the ground, they should push each other away, which will make the board float (a technology known as magnetic levitation). See how sweet and easy it is to say but in reality, it's really complicated and so damn difficult because to create a force strong enough to push up a board with a grown human on it, you need a magnet made of “superconducting” elements and to make it work, those elements have to be cooled to an exact temperature by a substance such as liquid nitrogen or helium, which is so tedious and expensive. I personally believe it's possible just that it's gonna take time before they will finally get it right, maybe sooner; maybe later! Now, since the real hoverboards seem to be very expensive, complicated and difficult to build, the idea of building a hoverboard that has 2 wheels with self-balance sparked up and that's how we come to have the two-wheeled scooter we see around today. It's not only those celebrities listed in the beginning of this article that can afford and use these beautiful two-wheeled scooters, you can also get one for yourself at a very affordable price. Before, it was very expensive (even some still sell for $1500-$2000) but now you can get it for as low as $250 - $500 depending on how you want it. And believe me, most of these smart scooters are made by the same few factories, just that resellers buy them wholesale and stamp their own labels & brand names on them, selling them overseas for a huge amount. Though, some high-end models have extra options like — Bluetooth speakers, remotes and custom paint jobs — but 90 percent of them are still identical, so you don't have to worry about the cheaper ones being inferior. You don't know where and how to get it? Well, never mind, I've got your back. You can check them out here on eBay or Aliexpress, choose which one you want (don't forget to read the feedback from other users so that you'll be able to know which one is right for you) and proceed with the payment. This is probably not your first time of buying online so you should be able to do that conveniently without hassles. I spent a lot of time to write this long, interesting and detailed post so please kindly share it with others on your Social media and let it be seen by everyone out there. I really want to know your view about this post, are you also interested in the two-wheeled scooter? Why? Please drop your comments and contributions via the comment box. Sweet Dreams!